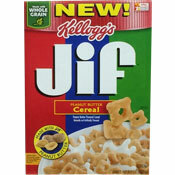 The complete name of this product is Kellogg's Jif Peanut Butter Cereal. It's made with actual Jif peanut butter. The cereal pieces are shaped sort of like square Cheeros with a hole in the center of each piece. 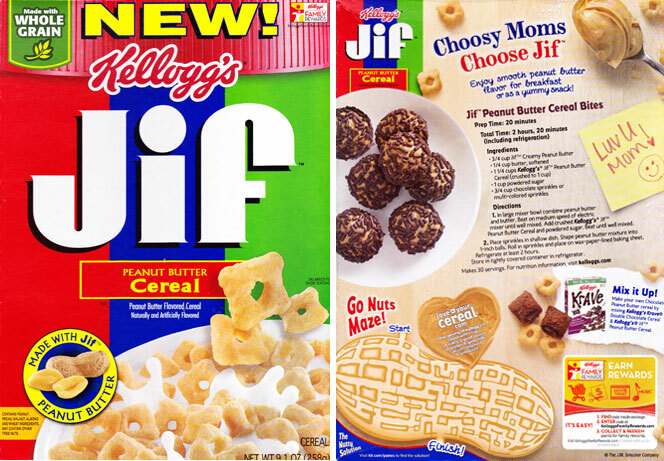 Upon the cereal's introduction, the back of the box said, "Choosy moms choose Jif. Enjoy smooth peanut butter flavor for breakfast or for a yummy snack!" The box also included a recipe for Jif Peanut Butter Cereal Bites and maze puzzle shaped like a peanut. The first 4 ingredients listed on the side panel (as of June 2014) were whole grain yellow corn flour, sugar, degerminated yellow corn meal and peanut butter. What do you think of Jif? Dang, I miss this stuff. One of the best! This is right there with PB Crunch. A great taste without a massive heap of sugar. Yes! So... I just tried this. And I have to say... BEST tasting peanut butter cereal I have ever, ever tried. Best peanut butter I've had in a long time. 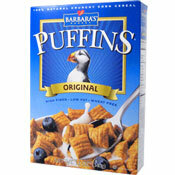 I enjoyed this cereal. It's nothing fancy, just a solid peanut butter flavor cereal that goes down easy. I'm not sure if it's better than all the other PB flavor cereals but it's a worthy contender.